Power disc front brakes with new rear drum brakes. Has original 10-bolt posi differential. Nice and strong BDS 871 supercharger with dual Holley's and MSD ignition. 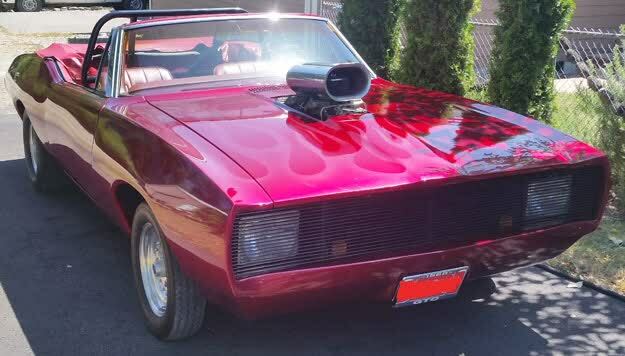 Good condition exterior finished Candy Apple Red with ghost flames. Factory red bucket seats with a custom roll bar. Black power convertible w/glass rear window. Full header w/3" dual exhaust recently added through to the rear of the car. Custom front surround grill and headlights. Cragar Racing drag wheels w/M/T fronts and M&H rears. Under-carriage & frame are solid and rust free. This car can be driven on the street or the strip. Cash only NO SALES CALLS!! This page has been viewed 1958 times.